Please friends and neighbours, come and see in the year of the pig tonight, or tomorrow, at The Bamboo Caravan. New year was Monday or Tuesday last week but we’re a little behind as all the staff have been off with food poisoning. Now we’re almost recovered and probably not contagious so reopening this evening… Anyway, to celebrate new year every dish on the menu, including the vegetarian options, will be made from pig and pork on top of which The Gay Hussar pub next door will be supplying us with some bacon based cocktails. Also, we’ve once again roped in Geri Halliwell and the Chinese State Mime School to do a rough approximation of dragon procession through the restaurant and the public toilets next door…. And get this, customers spending over £35 (per head) will get a free sparkler to wave around at midnight. Alan Ip. Manager. Bamboo Caravan. Come and see in the year of the goat tonight at The Bamboo Caravan. To celebrate every dish on the menu, including the vegetarian options, will be made from goat and The Gay Hussar pub next door will be supplying us with goat based cocktails. 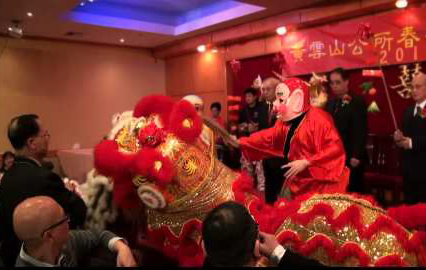 Geri Halliwell and the Chinese State Mime School will be doing a dragon procession through the restaurant and customers spending over £25 per head will get a free sparkler to wave around at midnight. Alan Ip. Manager. Bamboo Caravan.